'Oye Como Va' Tito Puente's song reached its widest audience when it was released by Santana, helping solidify their place in history as one of the fathers of Latin rock. 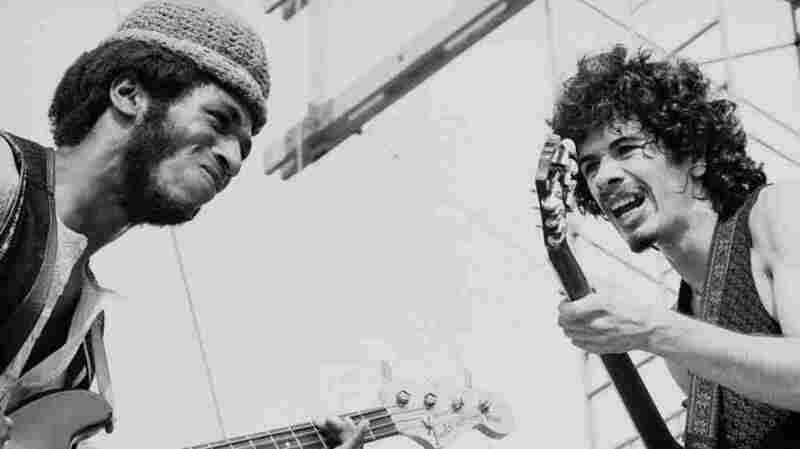 Carlos Santana with bassist David Brown performing at Woodstock. Thirty years ago next month, the band Santana released its second album, "Abraxas." It spent six weeks at the top of the Billboard album chart. From start to finish, "Abraxas" blends driving Latin rhythm with piercing rock 'n' roll. Perhaps no song on the album exemplifies this Latin-rock fusion more than "Oye Como Va," a Cuban cha-cha composed by a Puerto Rican New Yorker and performed by a Mexican immigrant and his San Francisco rock band. "Oye Como Va."
In 1963, at about the same time a teen-aged Carlos Santana was relocating from Tijuana to San Francisco, a NewYo-Rican band leader and master timbal player named Tito Puente was recording what was to become his most famous composition. Cuban music historian Max Salazar says Tito Puente's "Oye Como Va" was adapted from another song called "Chon Chu Yo,"(ph) written in the 1930s by the Cuban composer Israel "Cachao" Lopez. "If you listen to the beginning of 'Chon Chu Yo,' it's the beginning of 'Oye Como Va.' But that's all he borrowed, was the introduction. Puente built on top of 'Chon Chu Yo' and 'Oye Como Va' was the result." Tito Puente told me about his signature composition just a few months before his death this past May. "Oye Como Va--that means: listen to how it goes, come and enjoy it. That's what the lyrics mean. It's a cha-cha, they call it. That's a Cuban rhythm, what was very popular in them days and it still is. And people dance to that type of music." The catchy tune played well with Latin music fans, but it didn't reach a wider audience until Carlos Santana introduced it seven years later on 'Abraxas.' This hard-driving, cranked-up version of "Oye Como Va" soon became a hit single. "It just took you right in, you know? It just sucked you right in," says Cesar Rosas, lead guitarist for Los Lobos, says with 'Oye Como Va' Carlos Santana created a new kind of music: Latin rock. "He fused together two awesome elements, the most romantic two elements ever: one being rock 'n' roll, which is very romantic, electric guitar, blues-based; and then he also picked Latin music, which is extremely romantic. And when he fused those two together, it just exploded. It just went right through the roof. There wasn't anybody, I don't care what color you were, that you could not relate to. You know what I mean?" Carlos Santana traces his musical roots to such blues guitarists as Muddy Waters and B.B. King. His group started as the Santana Blues Band, playing on San Francisco street corners. In a 1994 interview with NPR's Latino USA, he recalled that before his family moved to the United States, he'd already rejected Latin music for being almost corny. "When we came to San Francisco, then I got exposed to Eddie Palmieri and Tito Puente and Ray Baretto and then Latin music sounded different. It didn't sound corny, you know? All of a sudden, it sounded like it sounds, like Afro-Cuban. You know, I never call it salsa, anyway. It's Afro-Cuban, 'cause that's where it's coming from." It was rock impresario Bill Graham, a New Yorker, who ran San Francisco's famed Fillmore Ballroom, who steered Santana towards Afro-Cuban music. Graham brought Santana its first hit, "Evil Ways." The song was first recorded by Willie Bobo, who'd been a member of Tito Puente's band. But Puente himself had no idea that Santana had recorded his song on the group's second album. "My wife was the first one that heard it. She was in a store, and they were playing it on an FM radio station. So everybody in the store was, like, snapping their fingers, loving it. And she said, `Why, my goodness, that's Tito's number, my husband's number. But who's that? He didn't record it,' not that style, anyway. So that's when we found out he had recorded 'Oye Como Va' on the 'Abraxas' album on the Columbia label." Santana dropped the horns that characterized Puente's original. Carlos Santana's electric guitar and Gregg Rolie's Hammond B-3 organ carried the song's melody. Ethnomusicologist Steven Loza, who's currently teaching in Mexico City, is the author of a biography of Tito Puente. He says, for all the changes, Santana's rendition of "Oye Como Va" is still basically a cha-cha. "Santana combined all kinds of elements, but if you listen to the bass line and the dum-bau being played by the congas and the timbal rhythms, you know, the essential part is still authentic Latin-Cuban rhythms." The song brought composer Tito Puente a windfall of unexpected royalties, and Loza says it also gave a boost to a lot of other Latin musicians. "'Oye Como Va' exposed the world to Tito Puente and to Latin music in general. And "Oye Como Va" helped catapult the salsa movement to the '70s because it gave the music recognition all over the world. And that inspired a lot of people to go into salsa." The influence spread well beyond Latin music and rock, says Ben Fong-Torres, who was a San Francisco deejay at the time and went on to become an editor at Rolling Stone. "'Oye Como Va' inspired among many other artists groups like Eric Burdon and War. When you think of a song like 'Spill the Wine,' you can hear the strong connection right away." The Latin grooves that other musicians started playing as a result of Santana's popularity spread his influence even wider, says Cuban music historian Max Salazar. Santana, through Latin rock and Latin soul rhythms, was able to open the door for non-Hispanics to come in and enjoy that. And it's one of the reasons why Afro-Cuban rhythms now are respected and enjoyed around the world. Tito Puente made "Oye Como Va" the finale for "Mambo Birdland," the very last album he recorded. He introduced the number at the New York club Birdland with a tribute to the man who put his song on the charts. "Beautiful Santana," Puente said in that performance. "He put our music, Latin rock, around the world, man. And I'd like to thank him publicly 'cause he recorded the tune and he gave me credit as the composer of the tune. So since that day all we play is Santana music."